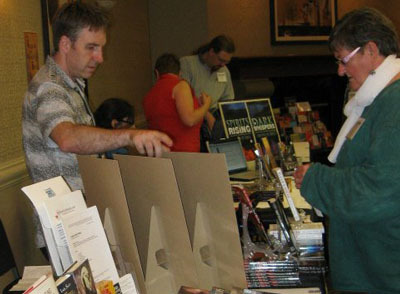 I’ve read so many articles on how to prepare for a literary convention…especially if you’re a writer looking to break into the market. Look at lists of agents. Try to set up appointments with editors (hahahaha! You’re a nobody!). Blah, blah, blah. Waste o’ time. My method involves acting like a 17-year old at 3am in the hotel hallways. Yup. That’s what success is all about. Everyone has their method, but after several of these things, I’ve realized a few things. 1 – agents and editors don’t really want to talk to the newbie. They’re too busy talking to the pros. That’s not to say they won’t talk to you, but it’s not as simple as them holding court waiting for you (though that does happen). I have long since given up on trying to meet the person who is going to get me to the top. We all have our methods. I go to the parties (and am rarely seen before noon) while my Apocalyptic Four writing comrade Billie Milholland holds court in the restaurant beginning at 6am (yes, 6am…I’ve usually only been asleep for two hours). Then again, Billie and I are diametrically opposed (which sounds like a bad thing, but really, our critiques are harsh(ish) and they always lead to better work) so I guess that’s not too surprising. The other thing to do is to leave your comfort zone. You will find a group. But don’t stick to them. They’re your safety blanket, but branch out. Be the butterfly. Flit. Meet tons of people and have a good time. The key to writing conventions is to network. Network, network, network. And don’t go trying to plug your book. It won’t work. Other writers don’t want to hear about it. Editors don’t want to hear about it. Publishers don’t want to hear about it. Weird, but true. Your job is to go to panels, meet people, get to know people. Yes, it can be frightening. But what happens is your network grows (Why, this sounds just like the business world!) and so-and-so knows so-and-so and stuff will start to happen. Seriously. For me, it started in Banff 2007 and I met a writing group with Eileen Bell, Randy McCharles, Bev Geddes, and the writing mentor Robert J Sawyer. I met them, and from them, I started to meet others. I could do the full spreadsheet of how meeting those people has spread into the hundreds (though those people are still the most influential and I can say that they’re all great friends now). Go to a few cons and I get to know people…before you know it…I now know lots of people. So please…don’t tell me about your book (not yet…not at the con). Tell me about what you’re reading, or watching, or other fandom experience. Get to know people. Then everything else will take care of itself.